The ever-growing Android Market is flooded with apps that never cease to push the boundaries for better user experience. These apps number by the hundreds of thousands, well past the halfway mark towards a million by now, but not all of them are crowd favorites. For every category there are hundreds of choices to pick. Well, I’ve done some filtering and have gathered a list of 20 must-have Android Apps an Android user should get. I’ve broken it down to a few categories, namely security, backup, communication, browsers, tools, launcher and entertainment so you can just look at the categories you’d want recommendations for. If you have other Android apps you would like to recommend, you can share your opinion at the comments section. Without further ado, the 20 Android apps you simply must have on your Android device. AVG Antivirus is a free antivirus app for Android. It is free and gives you many features to secure your Android phone from viruses, malwares and threats. By enabling the Find/Locate Option, you can easily secure your Phone from theft. It connects to Google Maps and shares the location of the phone. Other features includes killing running tasks to free up memory, lock and wipe data to protect privacy, and scheduled scans. 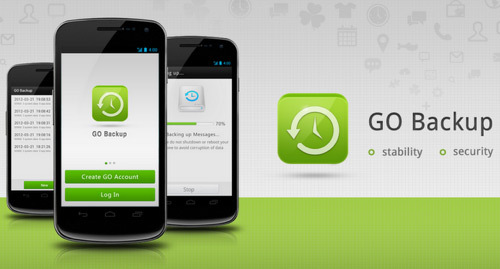 Go Backup is an all-in-one app that backs up your data. It can backup your phone contacts, messages, call log, and also the applications installed with app data to your SD Card. You can restore full backup or select what to restore manually. Facebook for Android is the official Facebook App which allows you to communicate with your friends, family and clients right from your Phone. With the Facebook Android App, you can send messages to anybody on your friends’ list anytime, and you can do real-time chat too. The app also gives you the option to update your status and photos. It also syncs your Phone contacts with Facebook friends and shows Facebook data in your Contact. Tweet right from your Android Phone and update your status instantly. You can follow your friends to see what’s going on with them. Other features of this app include Tweets, Retweets, the Follow option, photo and link sharing, and direct messages to your Followers. 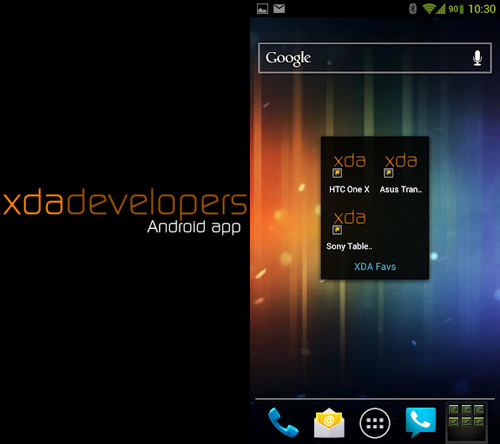 XDA is an Android application meant for developers and Android lovers. XDA is basically a forum where Android developers develop ROMs and share tweaks for the Android platform. XDA for Android is way of communicating for developers. You can ask questions and share answers, or talk about your favorite apps. Viber is another free Android application which lets you send free messages and make free calls from your Android phone to other people who are also using Viber on their phone. As long as both phones are Viber-enabled and have a data or Wi-Fi connection, then you can make free calls and send messages for free. You can also share photos and videos to your Viber Contacts for free. Opera Mini is one of the fastest, widely used browsers for Android phones. It has got a simple-to-use Interface which gives you the option to see either Phone View or Desktop View. It also helps you to save your data bandwidth using Unique Compression Technology. Like Firefox and Chrome, it has the tab functionality to open multiple tabs at the same time. UC Browser is another fast browser. Additionally, it supports multi-touch and also can recognize and navigate through voice commands. You need to Install Google Voice to make Voice Control work. UC Browser uses Cloud Acceleration technique to load webpages immediately. You can download files through UC Browser at high speeds. Dolphin Browser HD is a rich full-feature browser for Android. 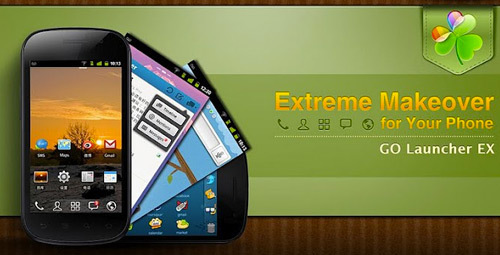 It gives you most advanced features and plugin integration that no other Android browser gives. Its range of features include Voice Navigation, Gesture Control, Add-Ons, Speed Dial, Tabbed Browsing and Sidebars. ROM Toolbox is a must-have Android App for rooted users, it gives you many options to tweak your phone. In Personalization, you can change your system font, download boot animations, and download ThemeChooser themes. In Performance Pane, you can tweak your system’s CPU sliders, edit and tweak build.prop, boost your SD card browsing and get memory management. There are also options like downloading and installing ROMs, make ROM’s backup and wipe Dtat / Cache / Dalvik Cache Partition directly from the ROM Toolbox Interface. You can also Manage Apps using App Manager and browse for System files using Root Browser in ROM Toolbox. Battery Defender is the most effective app to extend your battery life. It is not as complex as other apps in the same category, apps like Juice Defender and Easy Battery Saver. It just gives you the option to enable or disable Battery saving, and it works really well on my phone. It disables unnecessary processes and apps running in the background and stops Wi-Fi Connectivity when not in use or when the screen is off. Google Reader for android allows you to read all the news and feeds in one place. You can read all the latest news and posts from the popular blogs by adding their RSS Feeds to your Google Reader. It also syncs the feeds, so you can read these feeds on other devices too. Olive Office Premium is a free Android App that lets you view and edit documents like Word, PPT, XLS files and you can also read PDF files on it. Most other apps of this category are premium apps even though they offer generally the same features. Go Launcher is the most advanced launcher for Android giving you in-depth options to customize your phone. There are thousands of paid as well as free themes, plugins and widgets available for Go Launcher. QQ Launcher is another launcher which is made to look like MIUI Launcher. The recent update in QQ Launcher includes ThemeSupport, and other features like built-in locker and widgets. The launcher has a beautiful and attractive layout with many transition effects to choose from. Using Music Paradise, you can download free music right onto your Android device. All you have to do is Search for the Music or Album terms, then download the desired music. It also has an built-in music player which lets you listen to downloaded music right from the same Interface. You can listen to music while downloading other music on the same Interface. Zedge is a popular site to download Phone stuff like Wallpapers, Ringtones, Notification sounds, Live Wallpapers etc for your android phone. There are 7.5 million free downloadable item to be downloaded in the app and you can preview wallpapers or listen to audio materials first before downloading. If you are an app maker yourself, you can also sign in and upload your app right from the Zedge App. 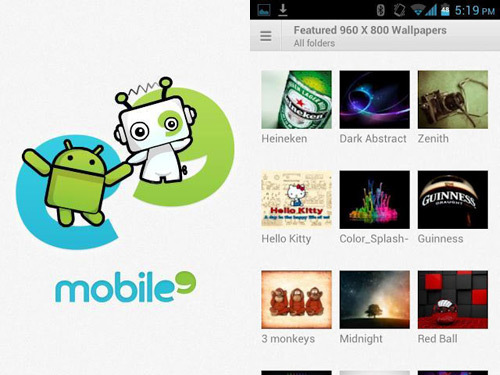 Mobile9 is similar to Zedge but it offers more than Zedge. Along with ringtones and wallpapers, it also gives you the option of downloading apps, launchers and themes into your phone. You need to register and sign in first before using the app. It has huge database of downloads for almost every phone. It automatically detects your phone and shows the stuff which is compatible for your Phone. Instagram is available on Android! This app lets you apply a variety of photo filters and effects after capturing photos within the app before you share it with other Instagram users. The most popular feature is the app which gives you the ability to create photos with the Tilt-Shift effect. 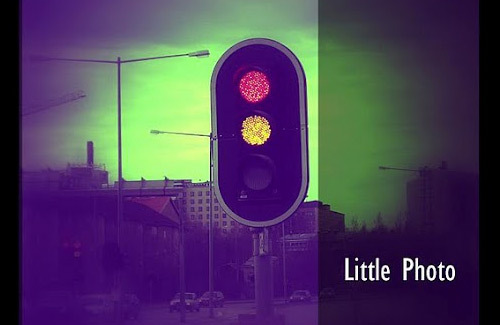 Little Photo adds film and effects to your photos. This is the most popular and filter-rich app you can use to customize your photos. With over 70 photo filters and effects, you can also create your own preset style by combining different filters.